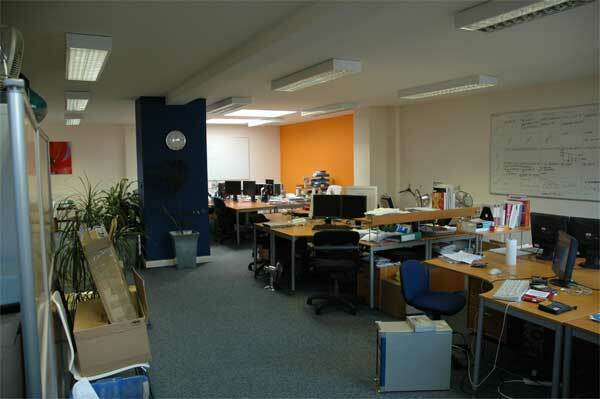 We were contacted by Foresite, a web design and development agency based in London. Their offices in Wimbledon were smart and functional but somewhat unimaginative. 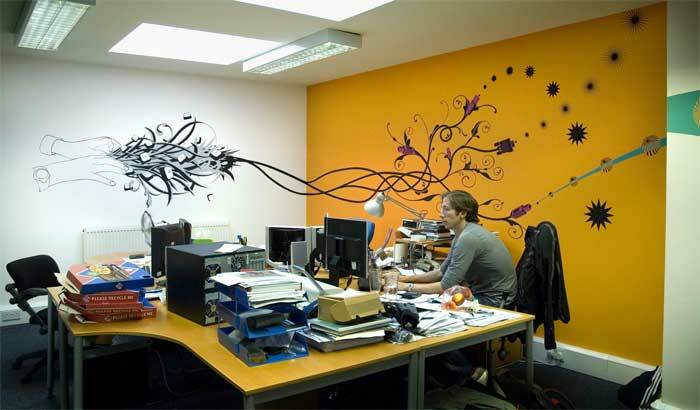 They were looking to find a company who could help them change the look of their working environment to better reflect the creative nature of their business. 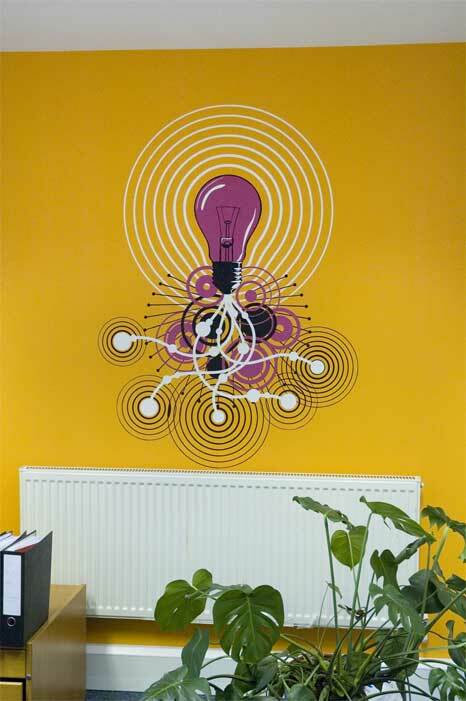 Through discussion with the Foresite directors and their staff we decided to develop a number of bold and dynamic stencil graphics which would cover a large amount of wall space and have the maximum impact for the budget. We worked with the Foresite brand colours of orange and blue alongside a couple of other strong shades to further develop the brand. Here we came up with a design to welcome visitors to the building using elements from the Foresite homepage (It made a vast improvement from the pile of toilet rolls and long life milk that had been there before!). 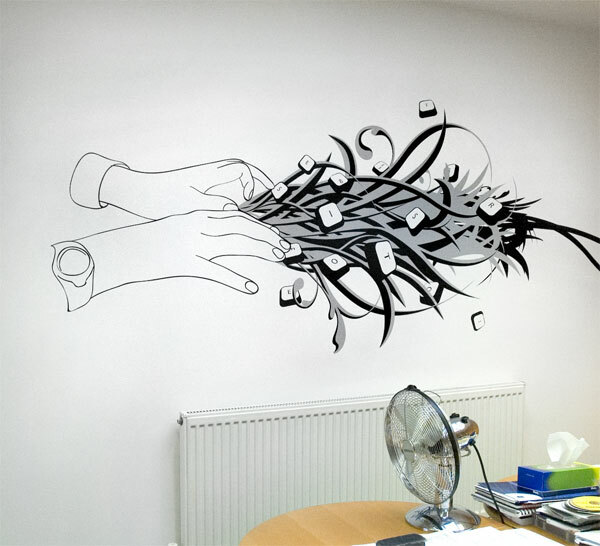 We chose to create an artwork that would reflect the creative process involved in web design and development from ideas to realisation. We felt it would be good to continue the narative theme up the stairs but in a less formal way. So we ‘planted’ a garden urn at the bottom of the stairs and grew from it a large trailing plant. As one ascends the stairs the plant first buds, then flowers, then the flowers wilt and drop their seeds onto the skirting board. Then as one rounds the top of the stairs on the landing one sees new growth appearing from the skirting and the cycle is complete. Here the designs had to be somewhat more formal whilst still adding life to the space. 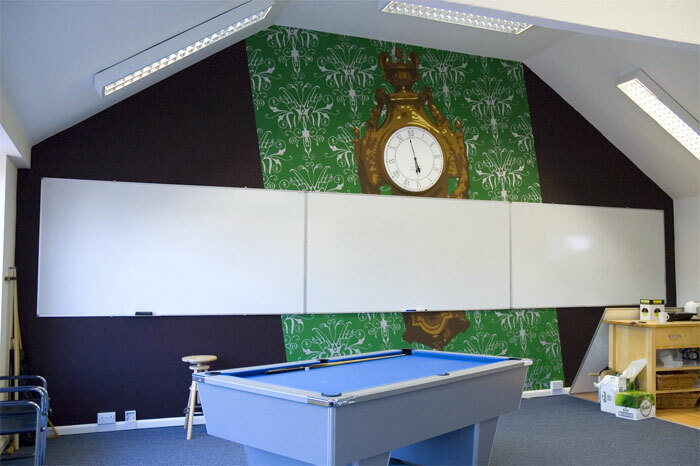 The directors had also expressed a desire for a clock on the end wall. 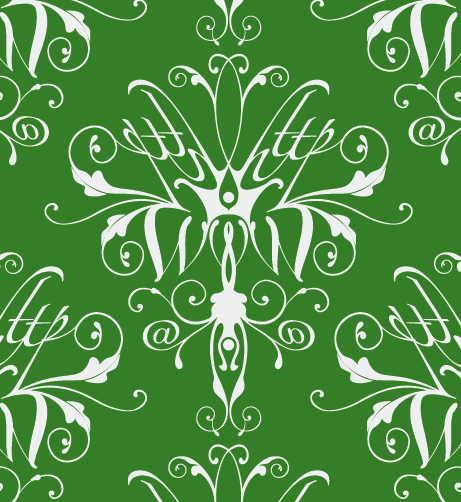 We struck upon the idea of creating a bespoke flock wallpaper design to reflect the company. 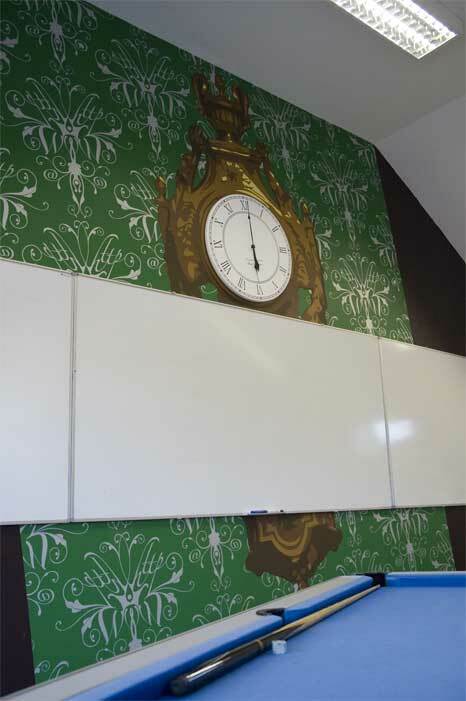 This we then stenciled in green and silver paint in a bold angled panel from floor to ceiling on the large end wall. Onto this we stenciled a vast rococo wall clock and then made up a working clock face to suit the surround. 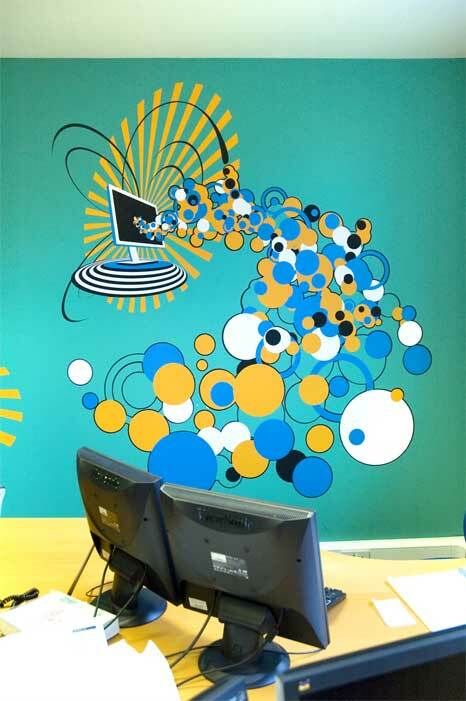 To balance this element of the design we added a rococo frame around the plasma screen on the opposite wall. 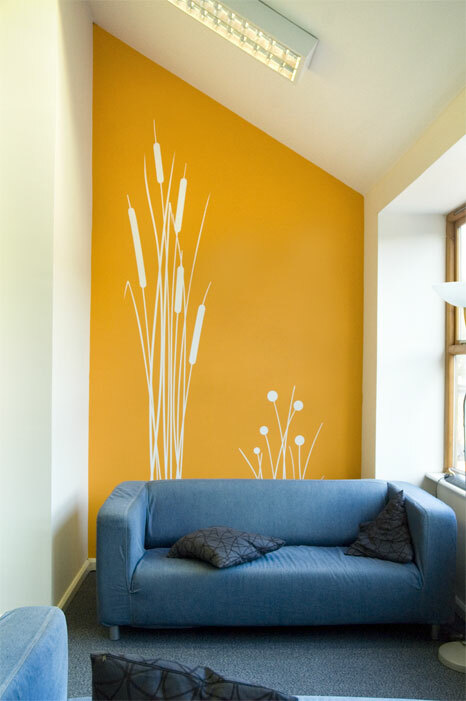 We also added a few white plant silhouettes to the orange and blue walls to soften the space.